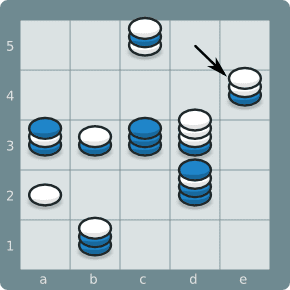 Please post a problem you like here, but for each abstract strategy game just one! 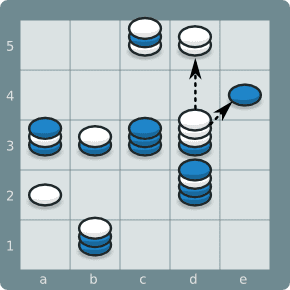 This Twixt puzzle was in the September 2008 issue of Chess Life. Blue to move. How can Blue counter the double threat by White d3:3-d5 (moving 3 pieces from d3 to d5) and d3:4-e4 (moving 4 pieces to e4)? The solution seems unusual, but is typical for Mixtour: d5:2-e4. Both targets disappearing. Uh, you're right, there should be a white piece or tower on b4. something in the background to prevent the split on d3. EDIT: I updated the images above, sorry.